There is a distinct difference between the smokey scents of a July Fourth BBQ and an indoor kitchen’s charcoal oven. The later aroma conjures the vibe of an old, cozy tavern on a cold winter’s night. Yet, B Too was bustling on a recent sticky summer evening, and the state of the art Josper oven, the only of its kind used in DC, was firing away. Mr. Green Bean and I met our favorite Sicilian-Italian couple, Mr. and Mrs. Sfingi, at this new edition to 14th Street for a much needed grown-up evening (albeit complete with smart phone documentation of their adorable 14 month old daughter). B Too is the second location for Belga Café creator and chef Bart Vandaele. The award winning chef prides himself for bringing traditional, high quality, Belgian cuisine and brews to Washington DC. B Too certainly looks the part. Surfaces covered in dark wood, chestnut leather, exposed brick and animal hide create a rustic, huntsman vibe. The decor stimulates a craving for beer, and luckily there are three gluten-free options amidst the pages of IPA’s, pilsners and ales. Cocktails and an extensive wine list also fill the pages of the beverage binder, which we nearly finished perusing after a few visits from our server. The food menu requires time to contemplate as well. Each of the cold starters, hot starters, soups, sides, mussels, entrees, and casseroles is described with a list of ingredients that intrigue and confuse, leaving the diner to wonder how the dish is actually prepared. I commend our server’s patience as my usual line of questioning was made more extensive due to general befuddlement and curiosity. 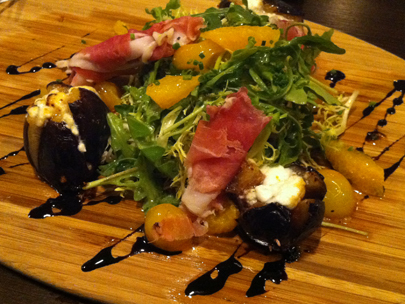 What was very clear was that we would be starting with the evening’s special appetizer, prosciutto with goat cheese stuffed grilled figs, frisée salad, and balsamic reduction. The sweet, creamy figs melted in the mouth, the winning feature of this dish that could have used more prosciutto and less greenery (it’s not often I say that). 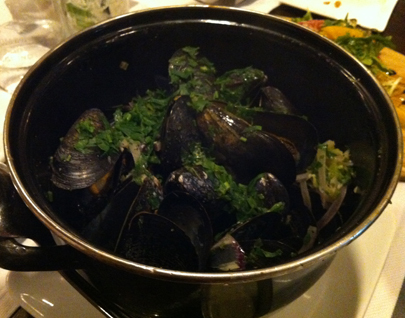 We also started with a pot of the mussels marinière, one of the few mussel preparations that does not use beer. The white wine based broth was bursting with flavor and contained large slices of shallots, garlic and parsley to slurp down with the mussel meat. The aromas wafting from the pot were tempting enough to get Mr. Green Bean to try his very first mussel. “Not bad,” he shrugged, a far better response than I feared. Baby steps, baby steps. Already full, I braced for my main course, concocted, as is often my habit, from a starter and a side. Unfortunately, or fortunately, the server confused which of the two shrimp dishes I ordered and I ended up with both. I had meant to order the Tomaat Met Noordzee Garnalen, baby shrimp prepared two ways, after the server gave the thumbs up on the accompanying krupuk (prawn crackers). The dish arrived without the krupuk, apparently not really gluten-free, leaving three hefty heaps of tiny grey shrimps separated by grape tomatoes and frisee salad. 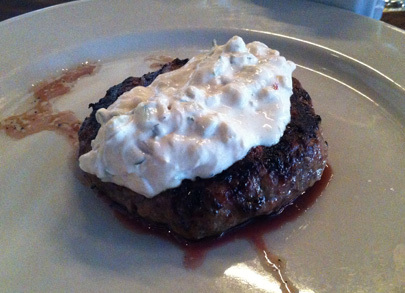 One stack of shrimp was mixed with a creamy aioli, resembling shrimp salad you might find at that July Fourth BBQ. The other two heaps seemed like the same recipe, minus the dressing, leaving me to wonder if something was missing. 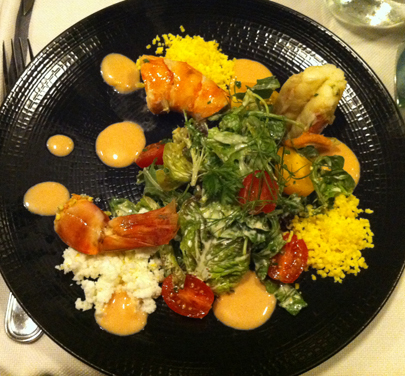 The abundance of shrimp became monotonous after the first few bites, and the accompanying salad offered little versatility. What I should have ordered from the beginning was the Gamba “M’as Tu Vue” dish that they let me feast on while my correct order was being made. Huge pieces of shrimp (two shrimps totaling 0.25 lbs) were perfectly cooked and served chilled with chopped and separated egg white and yolk, and a small lettuce and tomato salad drizzled with a creamy dressing. Dollops of what I can best describe as American French Dressing decorated the plate. The menu lists a Belgian whiskey sauce that I couldn’t decipher in the dish iteself (perhaps an imperceptible ingredient or omitted in the kitchen due to my allergy). But caution if you avoid grain-based alcohols. 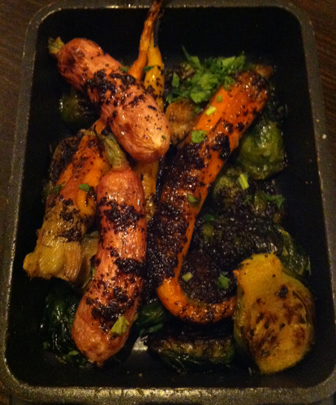 To accompany my plethora of shrimp, I ordered a side of the Josper cooked root vegetables with black garlic dressing. Brussels sprouts, carrots, and other more unusual root vegetables were heavily oiled and packed with delicious salty, smokey, garlicky flavor. Mrs. Sfingi ordered the Josper roasted lobster, which unfortunately is baked with breadcrumbs. 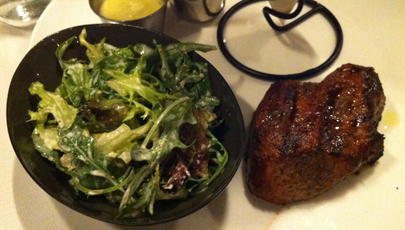 Mr. Sfingi and Mr. Green Bean of course ordered the Belgian steak, served with a side salad and cone of frites. 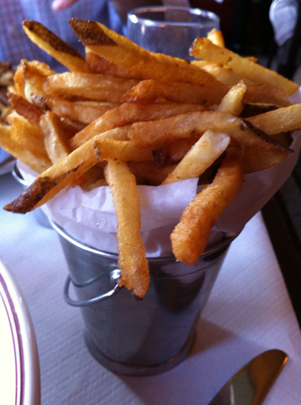 After some mixed responses, I finally confirmed that the frites are fried in shared glutenous oil. I did, however, taste the thick, generous portion of gluten-free steak, cooked perfectly, slightly smokey and well seasoned. I could tell it won Mr. Green Bean’s favor. We skipped on dessert, ice cream being the only option for gluten-free diners, and opted for a short walk to nearby gelato. Overall, B Too is still finding its gluten-free legs, but the staff is helpful in navigating past the many tempting and off-limit options. 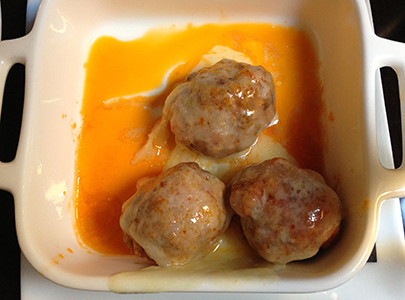 Well portioned dishes are heavy and rich, with a price tag to match. While the freshly baked bread served out of a paper bag was easy enough to ignore, B Too brunch featuring sweet, buttery Belgian waffles would be a real test of willpower for us Glutie Foodies. I will be back for dinner I’m sure. But it may not be until winter approaches and a heavy meal is needed to warm the bones. 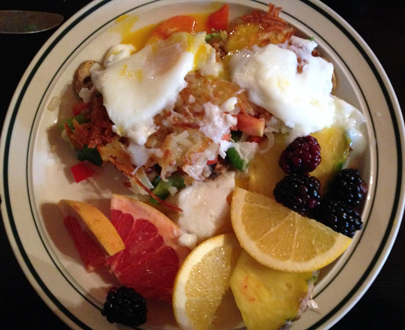 Categories: 3 Spoons, Bar, Belgian, Brunch, Comfort, Dessert, Dinner, Gluten-Free, Seafood, Washington DC | Permalink. I walk past the northeast corner of 14th and Q streets five days a week. Of all the construction projects in Logan Circle, this corner has been particularly fascinating. Over many months, a long-abandoned laundromat building was slowly gutted and reborn into the dazzling French bistro that now stands pompously as the new emperor of 14th. 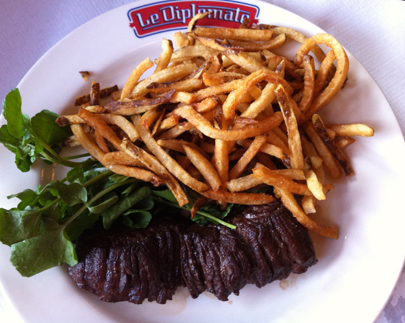 Starr Restaurants’ Le Diplomate has been bursting with activity from the second it openend. Mr. Green Bean and I wanted to see for ourselves what the buzz was about and were happy to find an open reservation on a recent Friday night. If you can elbow your way through the crowd at the entrance of Le Diplomate, you will find yourself transported to something between an elegant Parisian brasserie and a casual French cafe. A central bar is flanked by expansive, split level dining spaces packed with simple cafe chairs and tables lined with white paper. A handfull of burgundy leather booths accent the dark woodwork and salt-and-pepper tiled floor. Murky mirrors reflect the globe lighting fixtures hanging from high ceilings. A green tiled garden room off to the side transitions into a spacious outdoor patio filled with bright yellow folding chairs. Too hungry to wait for an outdoor seat, we opted for a cozy two-top by the window. Yet the interior space is so alluring, even the finest of days may not draw me outside. We settled in and perused the menu. I began composing questions for our server, planning to challenge the new restaurant’s gluten-free preparedness and bracing myself for an arduous process. To my amazement, our server didn’t blink an eye as I waited for his reaction to my “I’m a special diner” introduction. “Have you had many gluten-free customers yet?” I prodded further. “Of Course! No problem.” was his response (in a French accent) as he took me through the menu. I was stunned that flour is not a key thickening agent in items such as Friday’s special, Bouillabaisse, and that the Frites are fried separately from glutenous ingredients. Tempting hors d’oeuvres, such as the Steak Tartare and Tuna Carpaccio, are free of gluten. 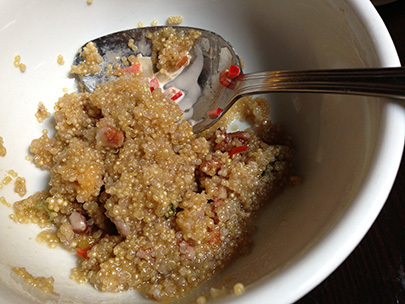 All four starter salads are either gluten-free or easily adaptable. 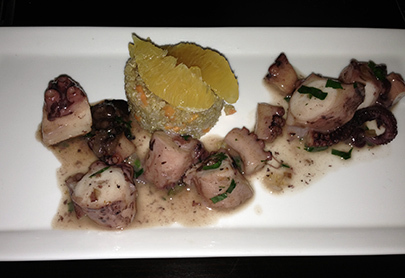 Entrees offer a number of options in steak, chicken, veal, lamb, skate, scallops, etc. I was repeatedly distracted by the towering platters of raw seafood whizzing by, as our server continued to list dishes I could eat. Mr. Green Bean’s meal decision was easy. When in Rome (or Paris, rather)…it would be the Steak Frites for him. I followed his lead and ordered another French staple, the Moules Frites. G-free frites are impossible to pass up. 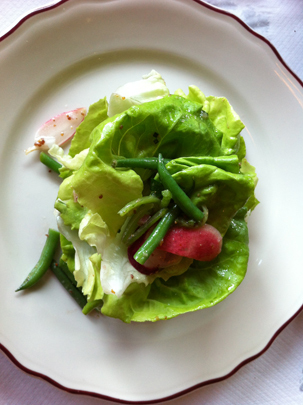 To start, Mr. Green Bean and I shared the Salade Verte with haricots verts, radishes and red wine vinaigrette. Large, crisp bibb lettuce leaves were sprinkled with Mr. Green Bean’s favorite veggie and thin slices of magenta radishes. 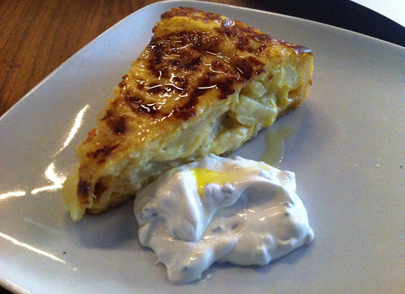 The dish was light and fresh, a welcome beginning to the richness that lay ahead. Mr. GB’s Steak Frites arrived as requested, without the wad of maître d’ butter on top. The thick, generous, cut of hanger steak is smothered in butter before pan roasting and needed not a bit more. He sliced me a piece to taste (the dish is g-free). The beef was cooked to a perfect medium (although Mr. GB thought slightly too pink), with a crisp exterior sealing in all the juices and flavor. I later went back for second and third bites. The moules are prepared marinière style, which I learned at Le Diplomate means white wine, fresh herbs, and plenty of butter. 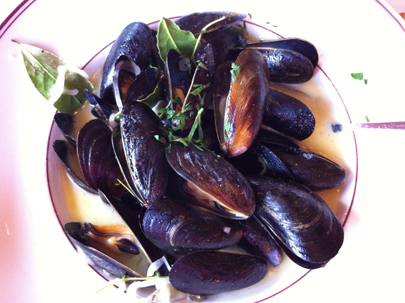 The sauce was aromatic and well balanced with the subtle flavor of the mussels. While not a huge serving, the dozen or so mussels were each plump, flavorful, and situated loosely in open shells. There was not a bad egg in the bunch. I paired my meal with a glass of the house’s unusually yellow-toned rosé, light and refreshing. The frites were everything I hoped they would be: double fried for an extra crispy shell, and just thick enough to maintain a soft potato interior. I alternated dips between the creamy mussel broth and the accompanying mayonnaise sauce (I can only stomach mayo when it is house-made French style and not squeezed from a plastic bottle). The serving was huge, surely I would not eat them all. Somehow, 30 minutes later, I reached back in the cup and found only crumbs. Both of our meals left Mr. Green Bean and I little room for something sweet. However, it should be noted that astonishingly more than half of Le Diplomate’s desserts are gluten-free, or can be with slight modifications. That isn’t even counting cheeses and dessert wines. From what I hear the desserts are belt-loosening worth it and I will definitely be back to try the Milk Chocolate Pot de Crème and Vanilla Bean Crème Brûlée. Le Diplomate has done everything right. Executive chef Adam Schop’s solid food is almost besides the point when considering how seamlessly this zoo is managed. I was impressed with the service from the on-her-toes hostess, to our confident and knowledgeable server, to the sommelier hand delivering my wine, to the general manager’s visit to check on our experience. The authentic French ambience allows diners an opportunity to escape, relax and enjoy good food and drink in Parisian fashion. 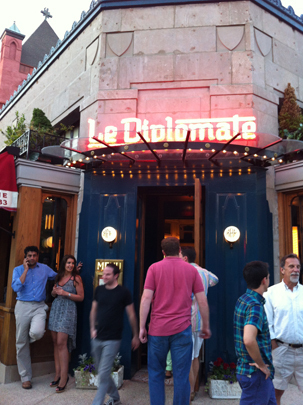 Bienvenue à Washington, Le Diplomate. 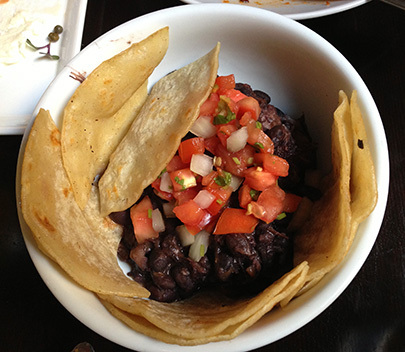 Categories: 4 Spoons, Bar, Brunch, Dessert, Dinner, French, Gluten-Free, Lunch, Seafood, Washington DC | Permalink. When Mr. Green Bean and I have out-of-town guests on a Sunday morning, are too tired to cook on a Wednesday night, or are up for a short walk to dinner on a warm summer evening, Open City is our reliable destination. 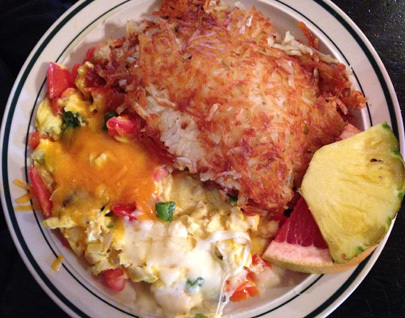 This Woodley Park cornerstone is a bustling coffeehouse/American diner serving fresh comfort food with a health conscious twist. Open City is in the Tryst, The Diner, and The Coupe family of restaurants, which all offer slightly different versions of comfortable atmosphere and dependable food and drink. In my opinion, Open City wins for having the most reasonably priced and comprehensive menu, with large, homey dining spaces both inside and out. Gluten-free customers beware of the tantalizing baked goods case at the entance to Open City. It has yet to include g-free sweets. Just make it to the table and one look at the menu’s g-free food options will quickly make you forget what you’re missing. Any place that concocts unique egg dishes and serves them all day long is my hero. But with other options such as big salads, bun-less burgers, g-free pizza, interesting appetizers and sides, mussel pots, and classic entrees, there is something to feed any craving. The coffee and tea list is just as abundant, offering Counter Culture Coffee and an assortment of teas in Black, White, and everything in between. Just remember to order your cup of choice sans the animal cracker garnish. I tend to forget this detail and end up with lion crumbs on my teaspoon. 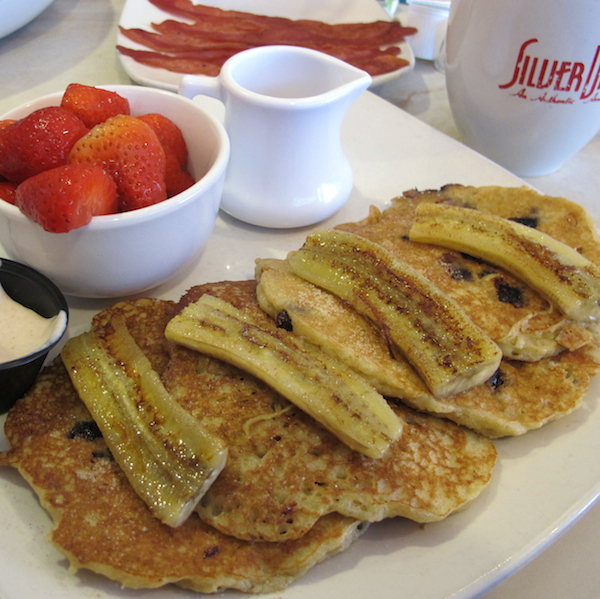 Open City recently switched from a dedicated gluten-free menu to indicating on their regular menu items that are gluten-free, vegetarian and vegan. I appreciate not having to ask for a separate menu, which I often feel draws too much attention to my “special” needs. (Note that many items not indicated as gluten-free can easily be adjusted. The omelets, for instance, are only missing the gluten-free indicator because of the accompanying bread.) The restaurant’s simple yet tasty American cuisine is hardly more sophisticated than what I can whip up in my own kitchen. But food always tastes better when you are not the one laboring over it, doesn’t it? The salmon scramble with tomato, chives and cream cheese is a salty pleasure. 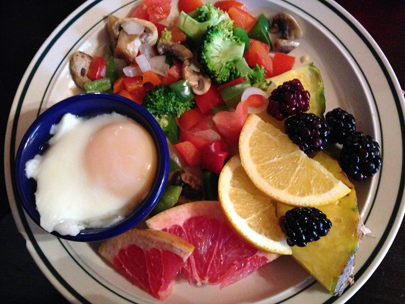 The Blanco omelet with egg whites, tomato, spinach, and mixed greens is light and satisfying. 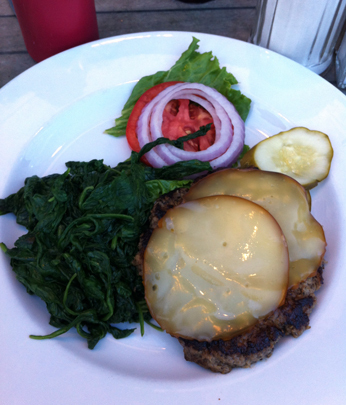 The large Turkey Burger patty plated without the bun is flavorful and juicy. For a treat, the side of gluten-free macaroni and cheese (yes, I did say gluten-free mac ‘n’ cheese) is deliciously chewy and cheesy. Mr. Green Bean, a Mac ‘n’ cheese aficionado, even gives the dish a thumbs-up. 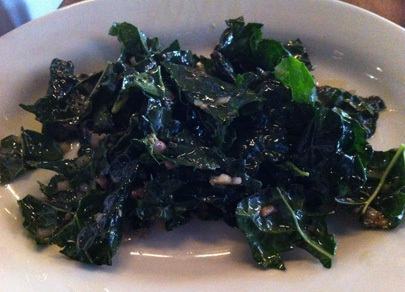 Pair it with one of Open City’s large, fresh salads to minimize the guilt. The kitchen uses Still Riding Pizza’s crust to offer rich pies that tend to be heavy on the cheese and grease, but gratifying when the pizza mood strikes. On a recent visit, I opted for a potpourri of sides to comprise one nourishing lunch. 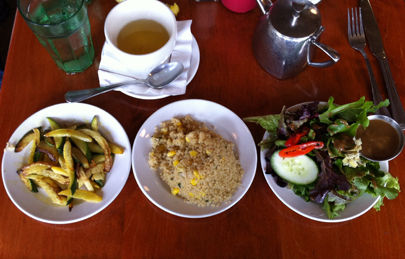 The quinoa with zucchini and corn, curried summer squash, and mixed greens offered a variety of textures and flavors, leaving me energized for the day. 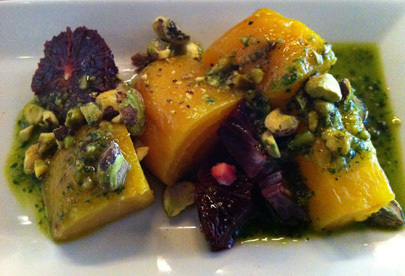 Open City’s menu changes occasionally, preserving key items while sprinkling in new dishes here and there. It’s a tactic that keeps me coming back. This popular Northwest eatery delivers unpretentious food and prices while managing to maintain a local vibe in a neighborhood infiltrated with zoo-goers and tourists. You will wait to be seated for brunch on a nice weekend afternoon; but at least you’ll be among fellow DC’ers who all agree it’s worth the wait. Categories: 3 Spoons, American, Brunch, Comfort, Dinner, Gluten-Free, Local, Lunch, Pizza, Small Plates, Washington DC | Permalink.